Sergio Calatroni Art Room in Milan have customized a wheelchair for Italian art director Fabrizio Sclavi. Therapies that use art have been popular for many years. One notable practice is color therapy. Colors have a strong influence on the human mind and encourages action in addition to guiding reaction, speech, and even attributes to higher-than-normal test scores. But did you know that art therapy treats more than just the heart? It can help the body too. There are a number of creative activities, crafts, and art projects that stimulate the human body and result in a better functioning person. People with disabilities know this is true. While having a disability can be challenging, its intensity is drastically lessened when people change certain behaviors that replace negative circumstances with positive action. Having a bright outlook and light heart can take a disabled person to a new level of personal success. These qualities are available to anyone with or without a disability through the wonderful world of arts and crafts. This is because it keeps the mind engaged and encourages creativity, confidence, and basic motor skills. Painting can offer relief from the mental and physical pressures of having a disability. In the subjective nature of art, every piece created is beautiful, especially the pieces done with full concentration and dedication. A beautiful work of art also makes a great gift. Creating greeting or thank you card is a craft that serves multiple purposes. 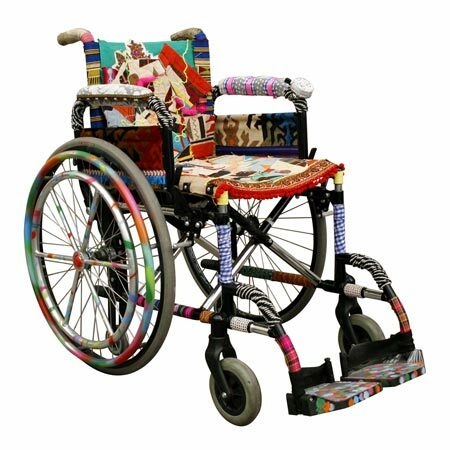 This is a way to stretch artistic abilities and show caregivers and family members appreciation. The efforts of creating a beautiful card is beneficial to the artist and he or she who receives it. In addition, it gives purpose to doing the craft project, which encourages the individual to see it through to completion. People with disabilities often have vibrant minds. Writing fiction short stories, full length novels, and even articles about living with a disability is a fantastic form of expressive art. It does not require any physical stress to the body and engages an individual in a long term, focused endeavor. Paint by numbers has always been a therapeutic activity. It engages the mind and body to work in harmony and guides the creation of an artistic masterpiece. They are not difficult to complete and as an individual nears the finality of the picture, an edifying masterpiece begins to emerge. Seg Tech is a virtual paint by numbers program. This means that a disabled person is able to create masterpieces without having the physical capabilities of a non-disabled person. All they need is an adaptive mouse (if necessary). Virtual paint by numbers merges the properties of number and color recognition in a way that stimulates the mind, while encouraging the individuals to commit themselves to completing a work of art. This offers people with disabilities 3 constructive qualities: Challenge, purpose, and a therapeutic outlet. It emphasizes the artist in each individual and encourages a sense of wellness only art therapy can provide. This entry was posted in Art, Art Appreciation, art therapy, Art Work, Artist, artwork, crafts, Paint, Paint by Numbers Online, painting, psychology, Segmation, Uncategorized and tagged activities for people with disabilities, Art, art therapy, arts and crafts, color therapy, colors, Crafts, disability, disabled person, paint by numbers, painting, people with disabilities, Segmation, virtual paint by numbers, Writing on October 3, 2011 by segmation. I had a real smile at the arty wheelchair. I fight a debilitating mucle-wasting auto-immune disease and while I don’t use a wheelchair myself, have on occasions and it’s something I battle mentally and the jazzed up arty version is so much more attractive. I took up the violin a few years ago against the odds and have found it very therapeutic when it isn’t driving me crazy. It doesn’t always behave itself and at times it is difficult for me to hold it up but I am now doing second grade. I love painting but don’t seem to have time. Perhaps I should try a computer version where you don’t have to clean up afterwards. My daughter recently sang at a fundraiser for the music therapy at Westmead Children’s Hospital. Photography has saved my sanity for many years. When you are looking through the lens and focusing on something else, you get out of yourself. I love it!